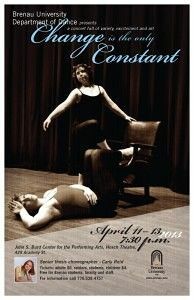 The Brenau University Department of Dance is presenting its annual spring concert, Change is the Only Constant, Thursday, April 11 through Saturday, April 13 at 7:30 p.m. in the Hosch Theater at the John S. Burd Center for the Performing Arts on Brenau’s Gainesville campus. The concert will feature ten unique works by Brenau Dance faculty, guest artists and students. Guest artists include Charlotte Boye-Christensen, artistic director of the Ririe-Woodbury Dance Company and Reyna O’Leary, a graduate of the Brenau University Department of Dance and director of dance at North Gwinnett High School . Boye-Christensen’s modern piece Stirrings received strong comments by adjudicators at the recent southeastern regional American College Dance Festival at the University of South Florida. Reyna O’Leary is presenting Shouting Whispers, an artistic view into the mysteries of autism, in partial fulfillment of her MFA from Jacksonville University. Brenau Dance faculty choreographers Cassandra Alvarado, Vincas Greene and Lisa Koepfer-Lock will each present new works. Works will range in style from modern dance to musical theater. Carly Reid, a Dance Education major from Commerce, Georgia, will present her senior thesis choreography works. Her contemporary piece Her Majesties portrays the complexities of the six wives of King Henry VIII. Reid states, “I hope to convey each queen’s time on the throne in a way which allows the audience to feel immersed in their stories.” In contrast, Reid will also present a solo work portraying an abstract awakening of a scarecrow and her ensuing curiosity. Performers include Brenau dance majors and guest artists from the Gainesville Ballet Company. Tickets will be available at the door. Seating is general admission and tickets are $6 for adults and $4 for children, seniors and students. Admissions is free for Brenau faculty, staff and students with I.D. Special pricing is available for Brenau alumni. For more information call (770) 538-4757. Don’t miss out on one of our most eclectic concerts yet! Brenau University’s Department of Dance: where our dancers constantly look to change how we express ourselves through dance.